An early morning call from the clinic at Chase Farm hospital informing me that I didn’t need to come in for a blood test that day was a great start to the week. My neutrophils were at 1.33 from the previous week and other vital components all moving the right direction. It was a busy week at work with 2 client visits. Fortunately I was able to travel to both outside rush hour, which for the next couple of weeks at least I will looking to avoid (mainly as I get to lie in in the mornings!). I also had a couple of rehearsals to attend with Regent Brass in preparation for the National Finals at the weekend (more on this later). On Tuesday, I caught up with some good friends dinner also, where I also had my first beer for ages. An interesting craft Irish stout from Co Carlow, did what it said on the bottle, stout with a hint of chocolatey espresso. As mentioned in earlier blog, I was still experiencing some side effects from weekend medication. Fortunately, this weekend the effects were very much lighter (if that is the right word) than in previous weeks (probably as a consequence of been stronger overall) so Mrs Q and I decided to take a trip to the Bloodwise (and other charities), Make Blood Cancer Visible installation in Paternoster Square. 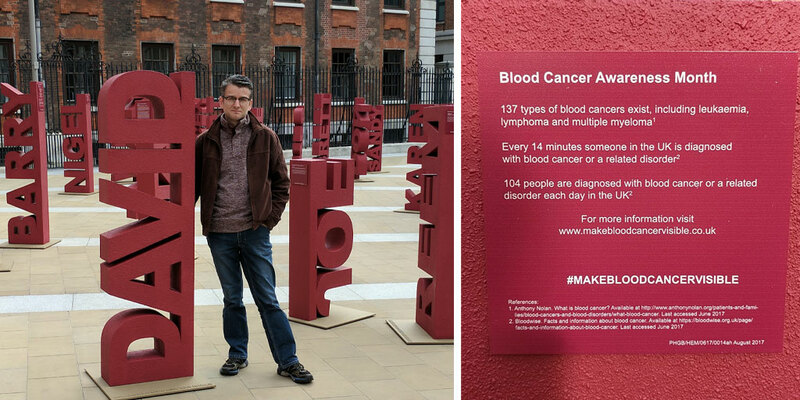 September is Blood Cancer Awareness month and this installation highlights the fact that 104 people a day get diagnosed with one of the 137 varieties of blood cancer each day in the UK. 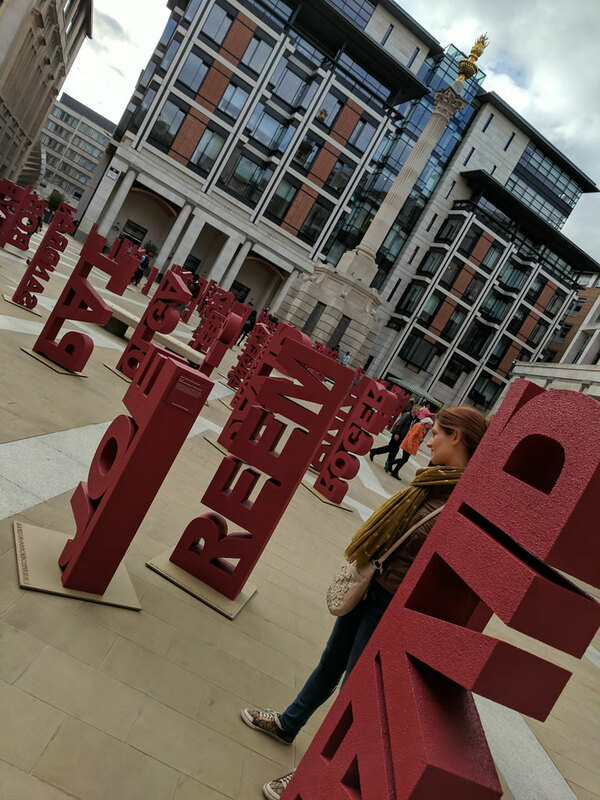 It was quite moving reading all the brief diagnosis and treatment experiences of all the volunteers, of all ages, whose stories are displayed on the name sculptures. I hope my namesake the David (38) Chronic Myeloid leukemia who’s story is on the sculpture I am standing beside above (and everyone else) is doing well. What was interesting in common with most experiences was the surprise at being diagnosed, due to not noticing or writing off the symptoms (much like I did), and then coming to terms with treatment, from the extreme and traumatic to the more innocuous. Another common thread was the fact that you could have a cancer that wasn’t a tumour, something that could be removed and that “chemo” just means taking medication… not necessarily always IV drips… it exists in many forms (similar to how I was surprised with my treatment). I’ve said it before, I’ll say it again.. take some time to read up on these diseases. They creep up on you! After spending a good 40 mins or so at the installation, MrQ and I took off for a stroll to have an afternoon tea somewhere, eventually catching the tube home at Highbury & Islington, so quite a trek! Sunday was contest day with Regent Brass. Long story short, loads of brass bands – 5 sections (think football league divisions), regional (or area contest) in March, qualifiers for finals.. these are the finals for sections 1-4. The “elite” section, “the championship” section get to play their finals in the Royal Albert Hall in October (I’ve played in 4!). The venue was The Centaur Centre at Cheltenham race course. Playing Eric Ball’s “Tournament for Brass” (with me on triangle & bass drum) we played 16th out of 17 bands in section 1 (so very much a hurry up and wait kind of day). Live coverage here! The judges in their wisdom 🙂 awarded us 4th place which we were quite pleased with, as performance went pretty much to plan. You can listen here on our sound cloud channel. I’m continuing to build my chops back up on my pTrumpet, so next time I’ll be back on brass, hopefully, if they’ll have me! Today (Monday 18th Sept) I have my second consultation with the haematologist at Chase Farm. The news is all good and positive, so much so, I don’t have to come back for weekly tests anymore (this weeks neutrophils 1.55). Next appointments in November. Getting back to normal… or the new normal… when I figure out what that means! This will be the last of the weekly blogs as things are returning to normal. I will blog every now and again when I have something interesting to say 🙂 Its on now with holiday planning, getting back into weekly Yoga classes, park runs, bike rides… build up some strength, as I know in a couple of months, I have another bone marrow biopsy (which is as fun as it sounds). Like I said however, reading some of the stories posted by other sufferers on Bloodwise blogs and facebook pages, I have got off extremely lightly with this disease. Like the doctor said, of all the nasties, this is the least nasty. Thankful for that.